If there is one country that every backpacker I met in South America told me they loved the most, it is Colombia. Colombia is a great country for anyone looking to have an adventurous holiday. It is full of life, colour, happiness, music and a culture that is so rich you can’t help but admire. It may not be the first destination of choice for most people, but, once you choose to visit this country, you will have an adventurous time. Travelling to Colombia for 30 days is the most ideal because there’s so much to do, see and experience. The sights and sounds will help you relax and unwind as you enjoy your holiday. Personally, I was in Colombia for a month. With this itinerary, we shall be looking at the most coveted locations in Colombia, and what you shall expect in each and every one of them. But, before we begin, here are a few reasons why you should consider Colombia seriously for your next holiday. Perhaps the reason why it is not your number one choice of holiday destination is what you have heard in the past. The conflict between the government and guerrilla groups which has been rumbling on since the sixties, or, you may have heard of the dangers in cities such as Medellin and Cali, which were popular with many wars, plus many other stories that have been told from generation to generation. Now, you need not worry about all that. It is in the past. Since the turn of this decade, things have taken a turn for the better. The country is now very safe, as most of these conflicts have been resolved, and, it has become a major tourist destination. The capital city has also seen a resurgence of 5-star hotels, new high-end restaurants, a lot of activities and many entrepreneurs are flocking to the city because of the many investment opportunities available here. There are also very many companies offering edgy and exciting sightseeing excursions, that you can take on a bike or on foot. These will cover everything, from the political culture to the architectural designs. Bogota decriminalized graffiti in 2011, and this opened the city up for creative new ways to display their art. Their office buildings, municipal walls, flyovers, and many other places became the canvases for some of the world’s most loved street artists. This will be the highlight of your trip. Head over to the local market and sample some of the most colorful cornucopias of fruits that you have ever seen. There are gorgeous guavas, zingy zapotes, luscious lulos, and of course the delicious dragon fruits. This is just a small sample of what to expect in their exotic selection of fruits. Colombia’s most important calendar event is the Barranquilla Carnival. This is the biggest of its kind and takes place before the Holy Week, for 40 days. This draws very many people including tourists. These are some of the many locations you can visit on your Colombian holiday. Now let’s get down to the nitty-gritty and what you shall be doing on your 30 days trip. 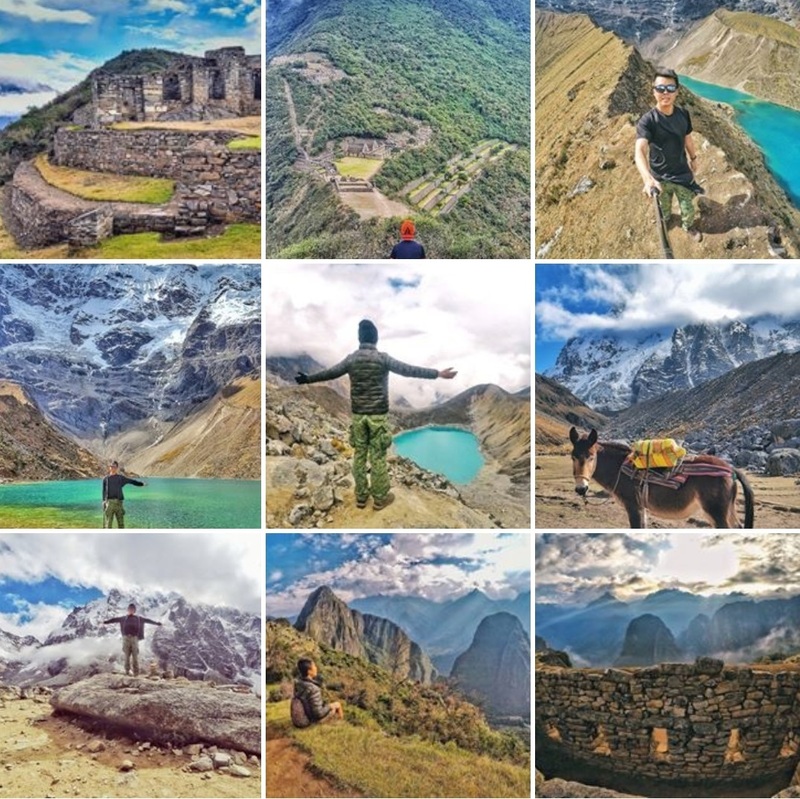 Note: I had limited time in Colombia and this is the route I took, but if you'd like a more detailed look into Colombia, check this mega Colombia backpacking guide. The first day will land you in the capital city; Bogota. This is not a place to explore in a hurry, so give yourself a few days. It has a lot to offer if you are willing to explore it. As mentioned earlier, this was once regarded as unsafe by tourists, but, has recently developed a new reputation for being one of the most exciting and culturally diverse cities in Latin America. This is perhaps one of the most popular museums in Bogota and the whole of Colombia. It has spectacular exhibits of pre-Hispanic culture, art and tradition. With more than 55,000 pieces of gold artifacts on display, it is an absolute wonder to behold. You will need more than an hour to tour this museum so come prepared for that. The whole display is laid out in thematic rooms that cover three floors. All the descriptions have been captured in both English and Spanish. On the second floor, you shall find the exhibits classified into regions and clear descriptions of how the pieces were in use during those periods. There are animals in gold, and fixed figurines indicating how women used to play important roles in the church. The third floor will tell you how gold was used in rituals and ceremonies. This will truly be historical and an unforgettable tour. Tour guides are available in English, French, Spanish and also in Portuguese. 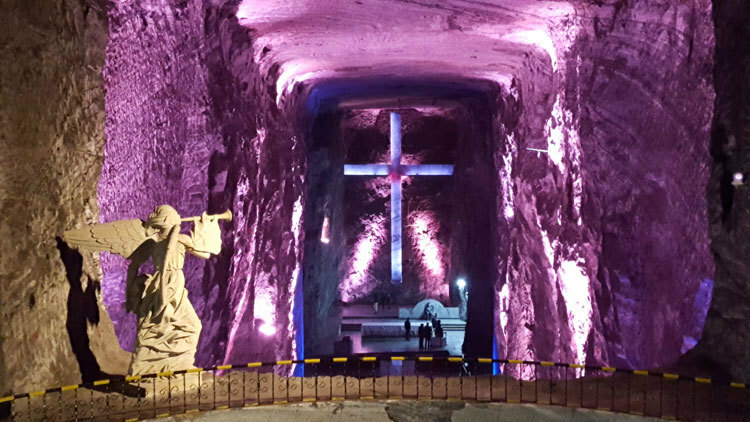 On your second day in Bogota, take a trip to the small city of Zipaquira, and get to see a church that was built underground. This will be a mile-long walk in a mine shaft that is made of salt. Hollowed out of a mountain, you shall walk for approximately one mile in order to get 200m below the ground so you can reach the Cathedral of Zipaquira. A place where more than 3,000 Catholics gather on any given Sunday for a religious service. For every few meters, you shall see thick metal beams covered in a thick protective red paint, running up from the floor and covering the overhead, then coming down to the floor on the other side of the passageway which is very wide. At about 30m in, there are small floodlights which are embedded in the floor in a crimson-red archer and next to the floor. The effect is quite striking and can be a bit unnerving. The entrance will look more like a pathway to hell. This is because of the beams of red, and the small lights all over them. A little bit spooky, but when you enter the cathedral, you shall feel a little relaxed. Here is where you'll understand why this cathedral is the named the First Wonder of Colombia. 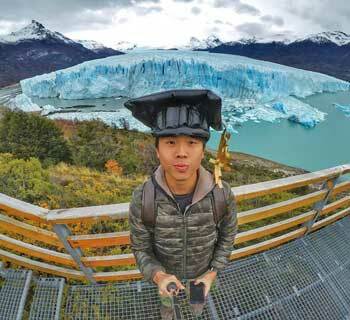 The entire trip will take you at least five hours or so, including the bus ride and if you shall need to stop for food and drinks, but you will get to understand why it is a major tourist sight. As mentioned earlier, graffiti art was decriminalized in Bogota, and it has become famous all over the world. The Bogota street art is both political and creative. It has also given birth to the most highly sought-after street artists whose work is commissioned all over the world. A trip to Bogota isn’t complete without a tour of this street art. It will clearly show the artistic interpretation of the country’s historical and current events. You can either tour the La Candelaria or Bogota’s downtown district, Destino Bogotá’s Capital Street Art or Bogotá Graffiti Bike Tour. Each will allow you to see all that is on offer in terms of graffiti art. The Bogota Graffiti tour is 'free' as it is tips-based. The bike tour is great for anyone who loves cycling, as you shall also get to explore the city and be able to visit the neighborhoods surrounding the town, you shall also get to tour the coffee factory where you can sample the coffee while on a break. This is available for $20, which will include the bike and any equipment hire. It will be three hours long and its available from Monday through to Friday. This is sometimes known as the Mountain-guardian of Bogota, and it is a place of religious pilgrimage activities. Due to the beauties surrounding it, it has become a natural, gastronomic and religious attraction which can be accessed on foot, using a funicular, or by cable car. It is a church high-up on a mountain, and if that doesn’t reel you in, imagine getting there using a cable car. It is a ride up in the air. Simply unforgettable. ​Hiking up the hill is a great option for visitors, because of the nature trail. There are many different sights to behold on your way to the church. This is however not for the faint-hearted. The church is located 3,150 meters above the sea level. That is approximately 10,355 feet or 7.7 kilometers. It may take up to three hours to get to the top. It is, however, worth it for the adventure seekers and those who love to hike. La media Torta – which is an ampi-theatre filled with renowned international artists, plus you can enjoy some home movies on Fridays. Universidad de los Andes – This is a nonsectarian university which offers many different disciplines to the Colombian people. Casa Museo Quinta de Bolivar – a must-see colonial house. The Basilica of the Fallen Lord Christ – this is the church right on the hill. Monserrate Market – this is found behind the church. Santa Clara Restaurant – this can be found south of the church. It is a beautiful colonial house that was built in 1924. It may be a long and tiring hike but getting to the top is well worth the trouble. You will then get to do some shopping in the market, and have a meal at the restaurant, making your hike quite successful, fun and memorable. See this detailed guide on where to stay in Bogota, including the different zones and hotel recommendations. The next couple of days will take you to Medellin. It is important to note that this city was once known as the most dangerous city in the world, due to the drug-fueled violence that was caused by the famous Pablo Escobar. It has however undergone a great transformation, and there have been some huge improvements in public safety. This is where Colombia’s first ever metro system and cable cars which are used to service people in poor neighborhoods were developed. Now, Medellin has become one of the “it” cities of the world because it has tons of tourists and foreigners visiting and even settling there. There are many mountains to see, very friendly locals, warm weather and a vibrant culture. Fun fact for Singaporean: Medellin received the Lee Kuan Yew World City Prize in 2016 for its remarkable transformation. Comuna 13 is a neighbourhood that has had a very tumultuous past but now has a bright future. The barrio is filled with art which describes its history. It has an authentic atmosphere and is located away from Medellin’s affluent areas. During the years when things were very bad in Comuna, the city experienced a lot of insurgent groups that left hundreds of people injured and many others missing. In the mid-2000’s years, the government stepped in and started re-building the town. Six sets of escalators were installed, and this is the main tourist attraction you shall see in Comuna 13. The over 3,000 residents now have a much easier way of moving around from one place to another. When you start walking around the steep Comuna 13 you will finally understand how important the escalators are. Other than the escalators, there’s a lot of graffiti in the area. The beautiful intricate graffiti art on the walls of many buildings, tells the story of this town from the local’s perspectives and gives tourists an insight into what they have had to overcome. Comuna 13 also holds graffiti competitions and festivals that draws artists from all over South America. Wear very comfortable shoes as you shall be walking up and down many stairs. Go with a tour guide, so you can learn more about Comuna 13, as opposed to walking on your own, and just looking at the graffiti without an understanding. Bring along some cash. The delicious Colombian fruits can be purchased on the sidewalks, plus there are also some souvenirs you can buy. Pack an umbrella as well, as you shall be walking outside where there’s always a chance for rain. The famous sculptor Fernando Botero Angulo was born in Medellin, and at the Plaza Botero, you shall get to see his many larger-than-life sculptures which are centrally located in the old part of the city and can be reached using the local metro station. While there, you can check out the Museo de Antioquia. Entrance to this museum is free, and inside you shall find many of Botero's paintings and work from other artists as well. The metrocable transport system in Medellin is quite impressive and connects the city with residential areas that are built upon hills. It also expands to the Parque Arvi, which is a large natural reserve in the hills of Medellin, and a wonderful escape from the hustle and bustle of the city. The park offers a bit of peace and quiet, and also has an array of wildlife. In the nearby town of Santa Elena, you can grab a bite to eat or get a room for the night. Pueblos are small towns which offer the middle-to-upper class Colombians a chance to escape the craziness and the noise of the city. They do this mostly on the weekends. They will rent fincas (country homes) and enjoy some time alone. Guatapé is a must-visit town for anyone in Medellin. It is not part of the city but is in the municipality of Antioquia, and it is a very colorful pueblo. Located only 2 hours away from the city Centre, visitors go to admire the pretty colored houses, and are able to soak up the natural beauty of the area. The main attraction is La Piedra at El Peñol which is a towering rock that peers over the whole surrounding area. The climb is a little steep, as is most of Colombia, and this one is 700 steps high, but when you get to the top, you shall get to see the great views of the hills and lakes below. You can take the walk either independently or as part of a group. Do not worry. It is safe. It will cost you around 8,000 pesos / USD $4.15 to climb up the stairs. Guatapé is located on the edge of a lake, and you can take tours of the surrounding areas as well. This is done using a party boat or a speedboat. You will also get to see one of the remaining homes that were owned by Pablo Escobar on this tour. There are many tour guides in Medellin who can take you on a journey round Medellin town. The tours are completely free, but you will need to tip the guides as this is what they accept as payment. These run on weekdays both mornings and afternoons and are extremely popular as they allow you to experience life in Medellin as the locals do. In Medellin, the nightlife action is quite limited on the weekdays, but things start to slowly pick up from Thursday. Friday comes in big with night activities, while on Saturday, everything is hopping. The favorite local drink is aguardiente or guard in short, and it is a clear anise-flavored drink which is traditionally consumed as a shot. Do not be surprised if you see people drinking it straight from the bottle as well. It is often accompanied with water or a bottle of soda. Another drink is Ron Medellín Añejo. This is rum and is normally taken straight, with sprite & ginger or on the rocks. It doesn’t have a bad hangover the next day if you manage to skip the soda. There are very many places to go out at night, but the nightlife epicenter is the Parque Lleras. This is a dense collection of bars, restaurants and dance clubs which are situated along a little tree-filled park in the Poblado neighborhood. This is very upscale. El Eslabon Prendido – a salsa bar located downtown, and it is known for its live music on Tuesdays. Luxury – if you love reggae music, this is the place to be. At only $5.20 (10,000 pesos) you can get access to this popular club. Patio del Tango – This is one of the few remaining milongas in the city. A milonga is a tango bar. It is a great place for dinner, but you may need to spend a minimum of $ 15.55 (30,000 pesos) in the club. There’s really so much more to do in Medellin including partaking in the dozens or so festivals that take place each year. You can use the local transport systems, eat like a local, and you will not go overboard with your spending. For as little as USD $40 per day, you can experience this city the way it should be experienced. Nightlife in Medellin is why many people stay longer than expected in this beautiful city. 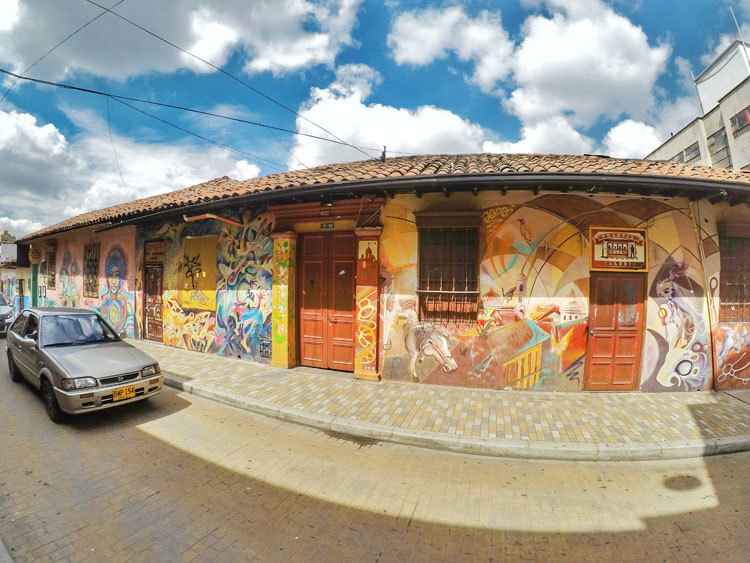 On the surface, Salento will look just like any other Colombian town. But, it has so much more to offer the would-be visitor. This is a town characterized by many colored buildings, an obligatory church (yes, that is true) and a very large town square. The city has slowly evolved into a thriving community filled with artisans and craftsmen plus the most prolific coffee producers in the region. What attracts most people to Salento is the desire to learn about coffee, and also admire the scenery of the Cocora Valley which is nearby. Even taking the bus ride is a highlight, as the journey to the region is extremely scenic.. This game involves throwing a metal disc/puck across an alley of about 15m long. You will be throwing them on to a one meter by one-meter board that is covered with clay. The disc itself is what they call the tejo, and the aim of the game is to hit some small parcels of gunpowder that have been placed on the clay. This is a great way to pass time with friends, as each shot awards you points, plus the parcels will explode loudly accompanied by a puff of smoke. This game is best played while drinking some beer. It's really cool to see gunpowder explode and a satisfying feeling. If you want to just chill out and relax, there are very many cafes available in Salento, and you can get to sample their wide array of coffees, and some cake as well. At the Café Jesús Martín, you will get to sample some of the best coffee grown in Colombia. 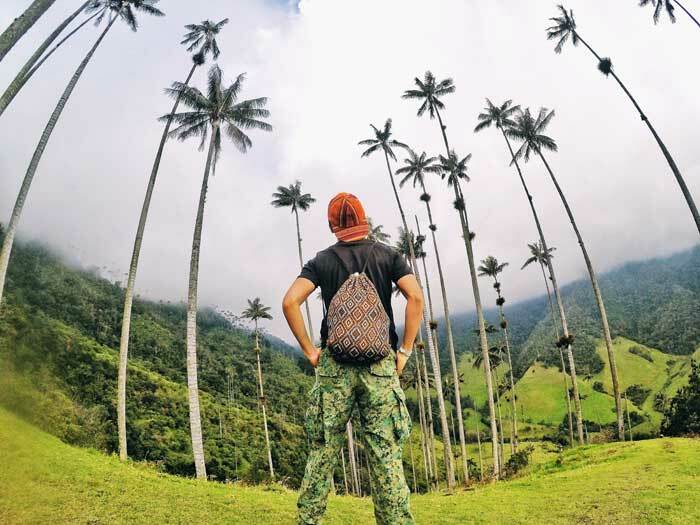 The great Cocora Valley is one of the main reasons why people will flock Salento. It is a part of Los Nevados National Natural Park, and this is where the national tree is located. The Quindío wax palm, which is the National tree is the symbol of Colombia, grows up to 60m tall. 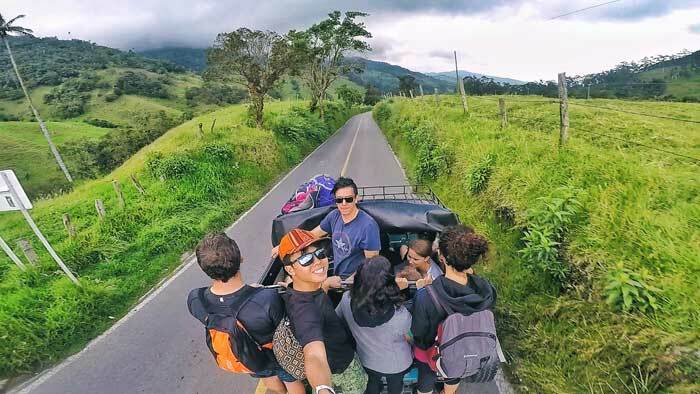 For you to get to Cocora from Salento, you can jump on the back of one of the jeeps, which are normally lined outside of the police station – you will find a timetable in the hut next to the convoy. Do this the night before, and it is recommended to get the first jeep of the day, at around 7 am, as the weather at this time is clear, and you will get to spend the whole day in Cocora. The jeep takes almost 40 minutes to get to Cocora, and the cost is 3800 pesos per person. They do cram people into it, almost 10 per jeep so be prepared for that, and some even stand for the duration of the trip. Once you get dropped off, there are a couple of hikes you can follow, though they all follow a similar circuit. Most people say you do not need a tour guide, but it is always safe to have one if you tend to get lost easily, and you get to enjoy the hike much better with some commentary about what you are seeing. The walks are a great way to spend your holiday in Colombia, plus there are numerous photo opportunities, with brightly colored birds singing in the trees and a very nice view of the forest, palm trees, rocks, small rivers, etc. It is also very peaceful and you can just sit on the grounds and ponder about how unique the place is. You can also camp in the valley and partake in many other activities such as bird watching, horse riding, swimming, rafting and mountain biking. At the end of this tour, you shall get to enjoy some home-made coffee on the plantation, and also buy some beans to take home to your family and friends. They do say that Colombian coffee is some of the best in the world, so this would be a great place to buy it. Click here to read about my experience in the Cocora Valley. Cartagena de Indias, as its commonly called, is one of the most popular and most visited cities in the Americas. Tourists are always flocking to this “jewel of the indies” in order to enjoy the many different sightings such as the historic walled city, the Caribbean climate in Cartagena, the unique blend of cultures and of course, the many nearby beaches. Cartagena has some of the best restaurants in the whole of Colombia, and there is something to suit each budget. Whether you want high-end eateries that serve the finest seafood, or you want market stalls with delicious stews made in bubbling pots, everyone will enjoy the different cuisines and flavors on display, not to mention the wide range of fresh fruit juices that are available on almost every street corner. The Colombian culture is very unique and in Cartagena, you get to see it almost everywhere you look. There are the iconic palenqueras, who are afro-Colombian women dressed in brightly coloured-dresses, selling fruits in the Plazas. These women have been internationally recognized as a symbol of the City. You will also find great architecture, art, and literature in this Cartagena. There’s never a dull moment here. Getsemani was once a dangerous place characterized by the presence of prostitutes and thieves. A place where no tourist wanted to visit. Now, years later, it is a completely different place. It has actually turned in to one of the coolest location in Colombia. Here, you will find a burgeoning street-art scene, hostels, plenty of hip bars and the Plaza Trinidad, where each night, travelers, locals, artists and street performers are found basking in the laid-back vibe and enjoying themselves. Horse-drawn carriages and cathedrals. A typical day in the old town of Cartagena. Cartagena offers professional photographers or just normal tourists a nice line of artistic angles and filters to help you take photographs. This is because, every corner looks like a postcard. Picture this; There are bougainvillea plants which are cascading from balconies, pastel-colored buildings, old metal door and knockers that have been shaped as lions or sea monsters. You are probably thinking of a few postcards you can send from this location by now. Cartagena is one of the world’s most photogenic city and a great place to visit if you want some good photos. Romantic atmosphere: Have your wedding in Cartagena. The novel Love in the Time of Cholera was set in Cartagena, and if the descriptions are anything to go by, you can be assured of a romantic wedding here. History; the country has an unbelievable history as being one of the biggest slave pots in the Americas. Colombia is one of those countries with a picturesque Caribbean coast, blinding stretches of white sandy beaches that have endlessly clear turquoise waters, and very many palm trees. Santa Marta is a popular tourist destination because it is located on Colombia’s Caribbean coast. This is undoubtedly one of Santa Marta’s biggest attractions. It encompasses the Sierra Nevada mountain and its biodiversity, and you will also find rainforests, pristine beaches and the archaeological remains of the ancient human settlements. This is a protected region, and you can camp in the park, trek the region or explore the forests and beaches. Or, just laze on the hammocks and listen to the waves crash on the rocks. Ahh, bliss. This is a small fishing village, located a few minutes from Santa Marta. It shares a border with Tayrona National park, and its one of the cheapest places in the world for you can go to get a scuba diving certificate. 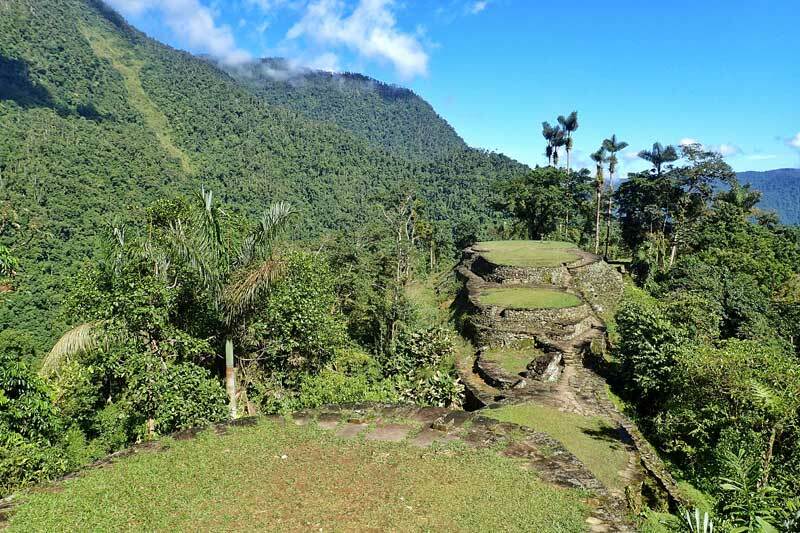 The Lost City, or what the locals call Ciudad Perdida is a site with ancient ruins, that dates further back than Machu Picchu. It is located deep in the mountains of the Sierra Nevada which are new Santa Marta, and the only way you can get to the ruins is by taking a4-day trek in the jungle. It is very adventurous if you are looking for a good thrill. You should note that there are only four operators who run the treks, and it is not possible to go without a guide. Click here to read about my experience in The Lost City. Visiting Playa Blanca for some much-needed sunshine. Eating some street food while walking in Santa Marta. Whatever you choose to do in Santa Marta, it sure will be memorable. San Gil is a small city that packs a lot of punch. It is the outdoors capital of Colombia and also the mecca for extreme sporting activities. It is best known for white water rafting, but also has other popular activities such as caving, paragliding, trekking, and rappelling. 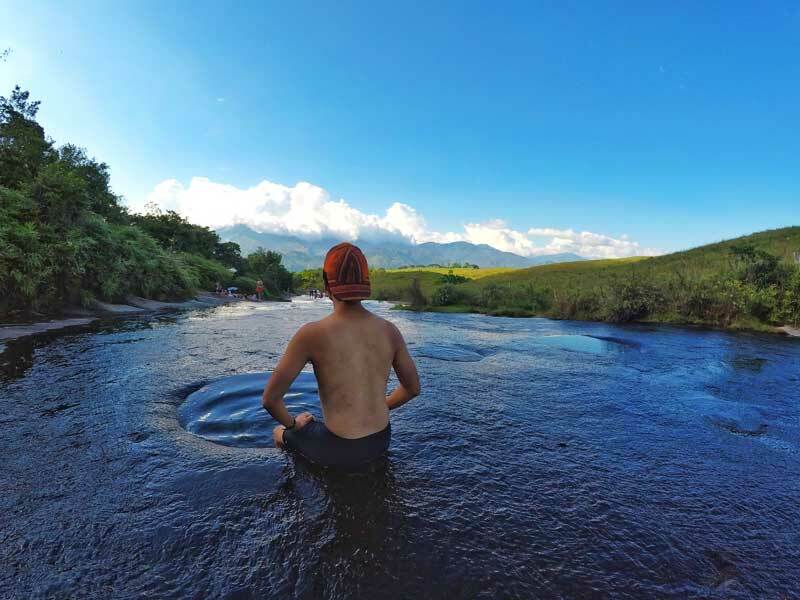 There is so much to do in San Gil, that you may end up spending more days there than earlier planned, so, if you are planning a trip to San Gil, go with some extra days in tow. Don’t limit yourself to your strict itinerary. This course takes 3-4 days, and you must first be a solid swimmer. It is a class that will teach you the basics of Kayaking such as important maneuvers, swim roll techniques, capsize training, proper paddling techniques and rescue procedures. At the end of the course, you will be a much more confident Kayaker, and can even surprise your friends and family on the next vacation. 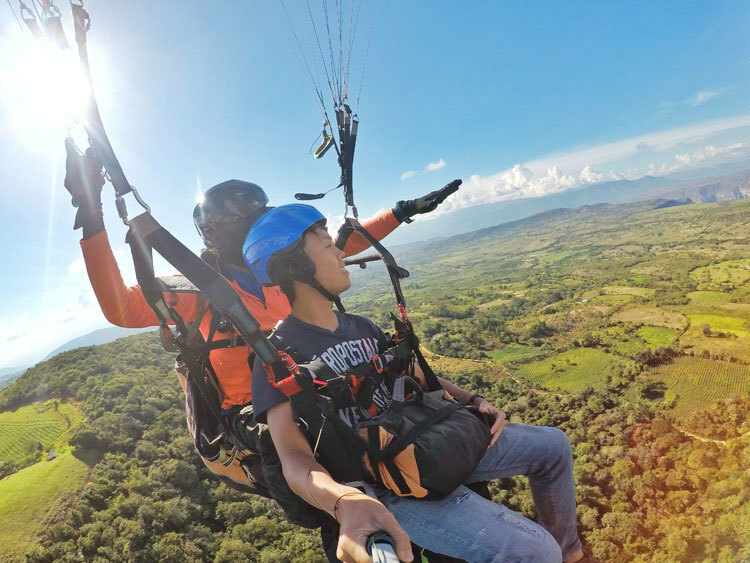 Paragliding is a sport where you have a parachute strapped on your back, and then you run off of a high cliff or mountain relying purely on thermals that can send you high into the air. There are very many paragliding opportunities in San Gil such as; Chicamocha Canyon & Curtiti. I came along many paragliding opportunities in South America but waited until I am in San Gil to do it as it is the cheapest place to do it. Please note that; if you are to engage in some paragliding activities you will need courage and a very strong stomach, and plenty of time as the whole process can take more than three hours. Cali is famous for its salsa obsession. The people in this town love nothing more than dancing to the rhythm of the beat, and you will find yourself doing the same things as it is quite intoxicating to watch. 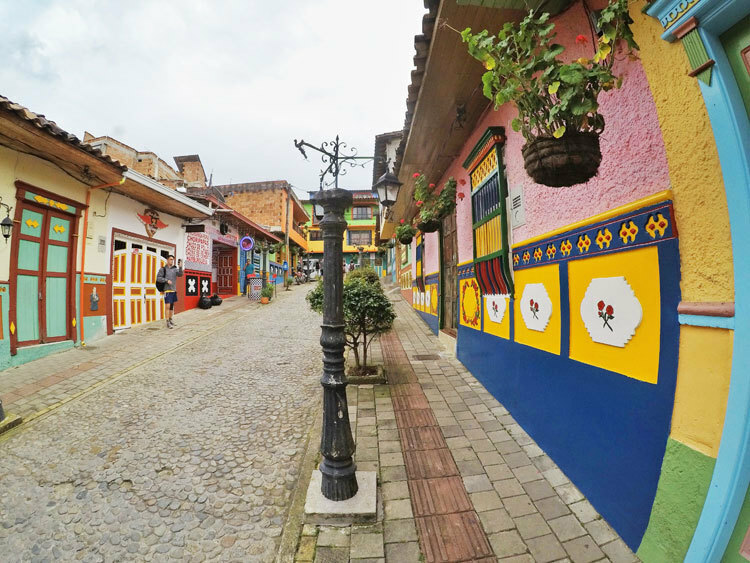 Well, other than salsa, there’s plenty more to see and do in this Colombian town. It will definitely keep you busy for a couple of days. From the natural retreats to the cultural heritage, here are a few of the main attractions in Cali. Zoológico de Cali – this is probably the best zoo in Colombia, and if you are there on a family trip, it is a must-see. There are exotic animals such as huge iguanas, pink Andean flamingos, tigers, and monkeys. Andoke – this is an undiscovered gem just outside of the city, and it is a huge butterfly farm that has over 15 technicolored butterfly species. Iglesia de San Antonio – this is an 18th-century church that has many unique wooden artifacts. Cristo Rey – This is a giant Jesus statue that you can go see. Gato de Tejada – This park is a rather unusual attraction in Cali that pays tribute to the Colombian artist known as Hernando Tejada who had created the famous central sculpture of a cat. After he died tragically, many different artists came together and sculpted many cats in his honor. Colombia has rapidly become the world’s go-to location for thrill seekers and adventure travelers. It has many different locations to make your trip as adventurous as possible. Now, you will not believe what you shall find in Quebrada Las Gachas. This is an off-the-beaten-track red river, which is a series of pools along a shallow river. Yes. You probably have never seen anything like it, and it may look a little spooky, but there are some plunge pools within the river. 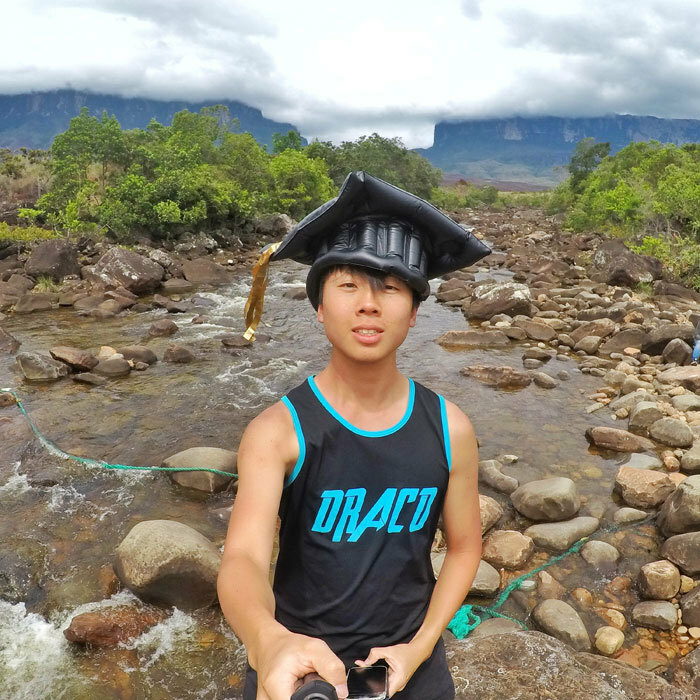 The river is very shallow as the water flows into the pits, but you can walk on the river bed comfortably. There are algae on the surface, making it slippery and adds a purplish/red layer making it very unique to the human eye. In fact, this place is known as the Santander’s Cano Cristales, which means the colorful river in Colombia. This place is free to visit and remains red all year round. You will find people in the pools just swimming and enjoying nature. This is probably the most underrated place in the whole of South America given how easy it is to get there. Read my guide on Las Gachas here. 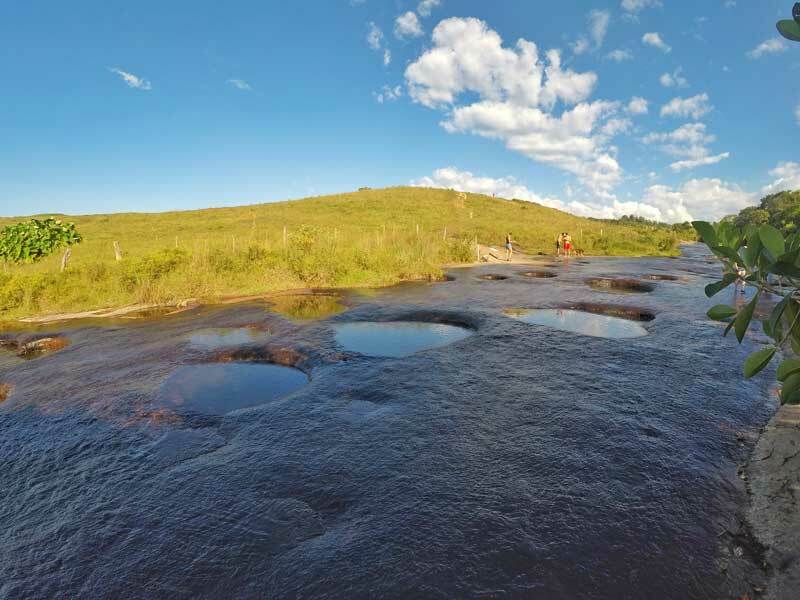 Within the Serrania de la Macarena National Park, you shall find the Cano Cristales River. This river is one of the most unique rivers in the whole world, and this is due to its many colors. The colors are created by algae, different plants, rocks, and sand. The most noticeable color is the bright red, which is caused by a plant known as Macarenia clavigera. How do you get to Cano Cristales? The town closest to the National Park is La Macarena, and the easiest way to get there is by flying. You can either fly from Villavicencio or Bogota. Once you arrive in La Macarena, you will need to find a tour guide and book a tour, as tourists are not allowed to access the National Park by themselves. The colors can only be seen from mid-May to early December. The tours take 2-4 days and will take you to other areas of the Park. You will not use any sunscreen or insect repellent as you swim in order to protect the aquatic life. Ensure to get your yellow fever vaccine well in advance. There is only one ATM available in La Macarena, so come prepared with some cash, to avoid inconveniences. The tour costs $80-$400 depending on the duration of time you will spend in the park and the number of people in your party. Cano Cristales is probably my biggest regret in Colombia. I had to give it a miss due to the season and the cost of getting there. If I ever return to Colombia, you'd be damn sure I'd plan my visit around it. 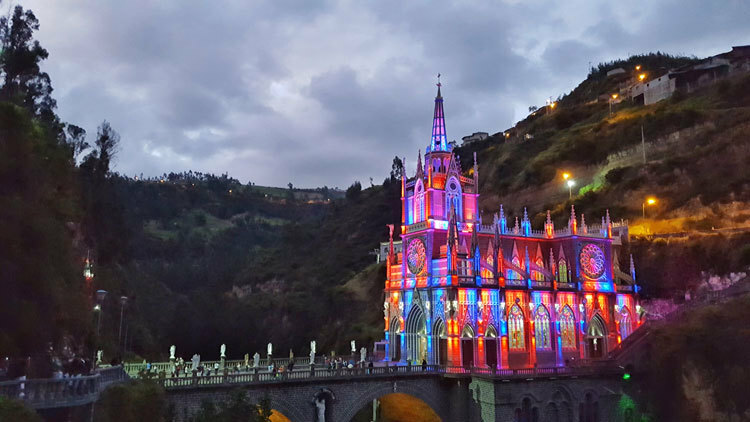 Las Lajas Sanctuary - It is stunning in the day and colourful at night. This is the route I travelled in Colombia personally and I could readily recommend. If you followed this itinerary and stay the bare minimum, you'd need at least 20 days in Colombia. The problem is that the hospitality and friendliness of Colombians always make backpackers stay for longer than intended. 3-4 weeks is perfect for Colombia. Ignore the negativity in the media and give this beautiful country a visit. Nice recap here. Was looking for a Bogota guide and saw much more than that.